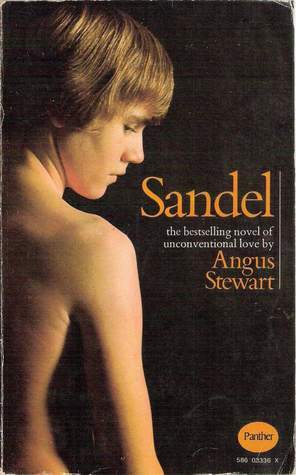 Frequent attempts are made to depict Sandel as a classic gay love story, rather than the classic pederastic one it is, often using the convenient euphemism of “boy” to describe 19-year-old David and so brush aside the critical difference in age between him and 13-year-old Tony. I’m relieved the new publishers have not succumbed to this nonsense, as they might have for marketing purposes, for it must have Angus Stewart, a lifelong lover of boys, turning in his grave. After asking David “Am I [a homosexual] because I’m attracted to you?” and establishing that a pederast means “someone who loves boys”, Tony asks him “What’s the specific term for a boy who loves a man?” to which David replies “I don’t know that there is one. Perhaps people don’t take you seriously enough to invent a special word.” How much less ambiguous can one get? Other reviewers have said enough about the literary merits of this deeply moving and loosely autobiographical love story whose emotional authenticity shines through every page. I shall instead confine myself to some observations on how tragically the climate for its reception has changed since 1968 when it received such critical acclaim from national newspapers. I may be in a peculiar position to do so due to having myself just published a boarding-school love story between a boy and young master for which Sandel is by far the closest precedent. The main differences are that my boy protagonist was a year older in physical development, which inevitably affected the tone of his affair, and more crucially that it is set in 1984 rather than the mid-fifties, so reactions to its discovery were devastating. Incredibly, one recent reviewer has implied a republished Sandel could expect a much more favourable reception “now that we live in more tolerant times.” What faith in the inevitability of progress it must take to be so blind to the vicious intolerance on this subject that has exploded over the last generation! My feelings rereading Sandel for the first time since I was myself David’s age have been overwhelmingly sad for this very reason. Writing in the increasingly liberal sixties, it must have seemed to Stewart that The Sunday Telegraph’s acknowledgement of “a love which truly exists and is not despicable” might be the foundation stone of a golden age of toleration and understanding. How bitterly disillusioned he must later have become! It is merely difficult to imagine today an aunt who would think or dare to rescue from their outraged school her 13-year-old nephew caught in his master’s bed, and dispatch the lovers on a ten-week honeymoon in Italy. It is impossible though to imagine anything but imminent catastrophe if today a choirboy being interviewed by newsmen were to tell them about his love for his teacher and the latter punched one of them to the floor for making snide remarks about it. The threat “You shouldn’t have done that,” couldn’t possibly sound “unconvincing.” The newsmen would know only too well that a visit to the police would ensure an investigation almost bound to wreck the lives of both man and boy. A difference in the reception of his and my novels is also I believe a sad reflection of our relatively closed-minded era. Stewart painstakingly addressed the moral complications involved in a love affair between a choirboy and a young man through ironic exchanges between David and his old school friend Bruce Lang. Not only were newspaper reviews as positive as quoted on Amazon towards the love depicted, but the original Times review of May 1968 had no patience with this drag on the story, concluding in an otherwise entirely favourable review that “the middle of the book indulges too many of these debates. Lang is a bore.” Though my protagonists in a more hostile age had no confidants with whom to discuss their affair, I still made them puzzle over society’s objections themselves. Yet in contrast to Stewart, I’ve been lambasted for glossing over “child abuse”, as if it has anything whatsoever to do with love stories that are self-evidently nothing of the sort and which an open-minded reader would judge on their own terms. One wonders how long it will be before the child abuse lobby succeeds in imposing on productions of Romeo and Juliet the interruption of the most romantic scenes with sour warnings that despite the strongest contrary indications love involving a pubescent is always really no more than false cover for a satanic plot to satisfy selfish lust. Sign into Goodreads to see if any of your friends have read Sandel. I also completely agree with your observations, we have indeed become a prudish, closed minded and intolerant society filled with hypocrites and self elected judges.